OK, let’s have a show of hands. How many of you have ever cooked a fantastic, expensive cut of meat to perfection, then watched helplessly as it overcooked when you reheated it? You splurged on a beauty – probably for Shabbos or Yom Tov – and now you have a leathery, unappetizing chunk. I’ll be the first to admit it has happened to me, and more than once. And that’s why brisket is my favorite cut! 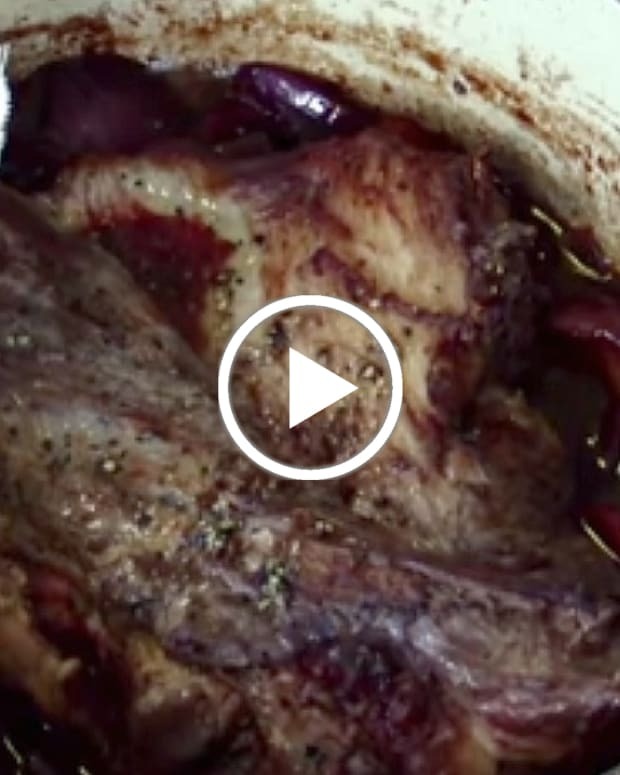 You can’t mess up when you braise a brisket. A top of the rib roast is equally foolproof - just treat it like a brisket and the meat will become softer the longer you cook it. 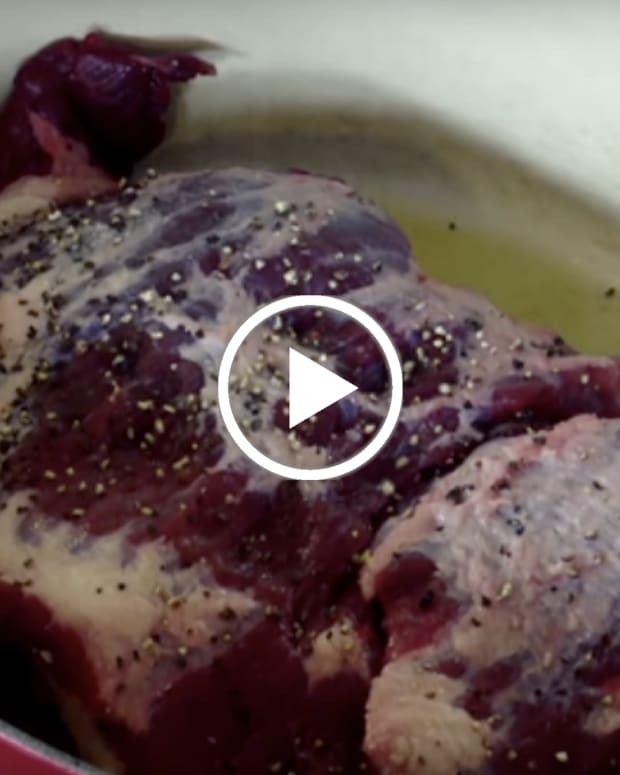 If you’ve never braised, here’s the scoop. 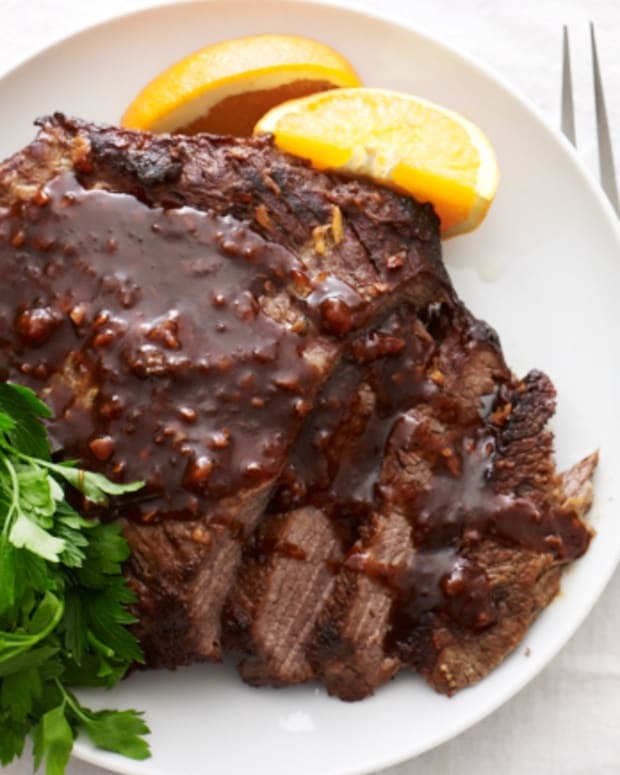 The principles of braising are moist heat, lengthy cooking in a closed, tightly sealed vessel, and low, low temperatures. Essentially, the meat is constantly basting itself, browning slowly, and taking on deep, rich flavors; it becomes so tender it could fall off your fork. 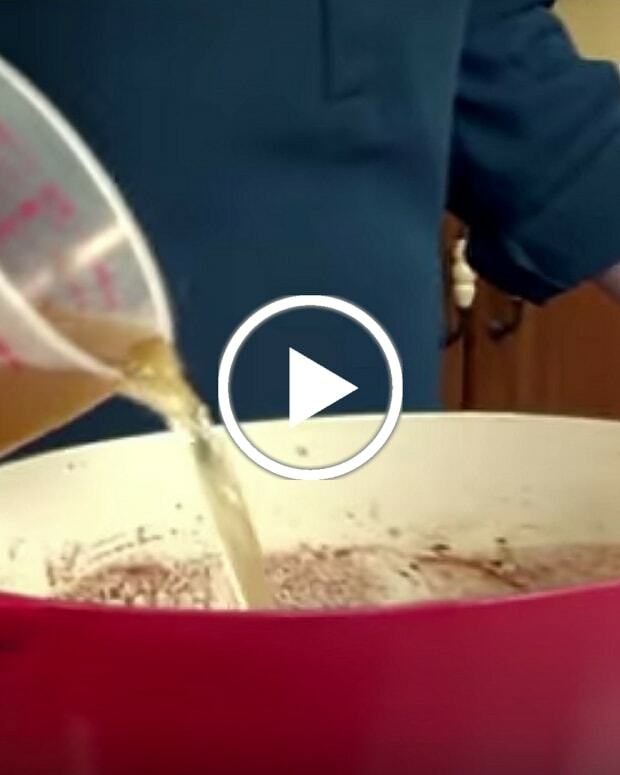 Of course, for this process to work, you have to give it loads of time to cook. But that’s a plus, because the aroma will fill your home, enticing everyone – your kids, your guests, your mailman, your neighbors. (Better be sure to get a big roast.) By the time they sit down to the meal they’ve been sniffing for hours, they’re ready to savor it to the max. 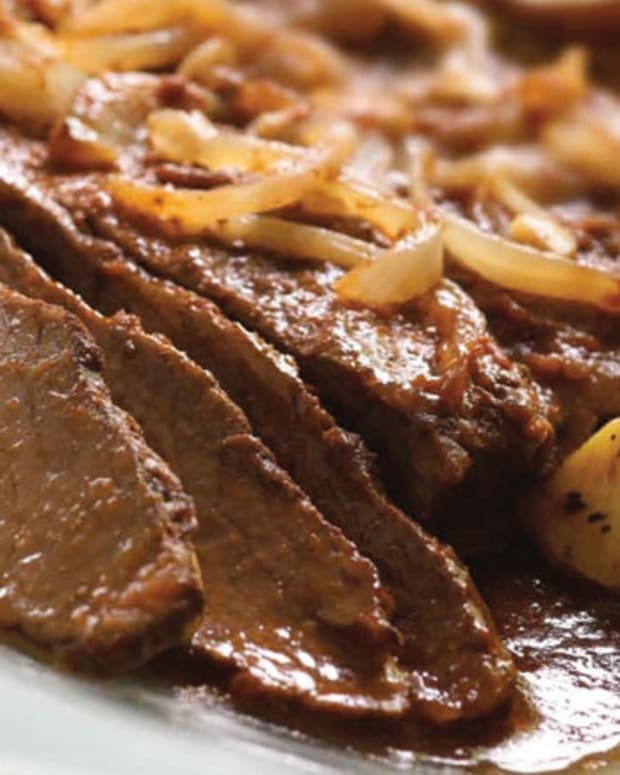 Beer is a wonderful braising liquid and I love the spice mix for my Beer Braised Brisket. It includes instant coffee, paprika and brown sugar; and that forms a nice spicy crust when you sear the meat before cooking. This cool crockpot dish comes out equally delicious from the oven. Cover and cook for 2 hours at 350° and then uncovered for another 30 minutes to 1 hour until soft. Most important – allow it to cool at least 15 minutes (if not completely) before slicing against the grain. You could even put it in the fridge overnight (after it cools, of course), before slicing. Oh BTW, to ensure soft meat, how you slice your brisket is as essential as how you cook it. Check out my “how to slice against the grain” post. When making this in the oven, you aren’t left with much liquid to turn into gravy, so consider these basic gravy recipes. 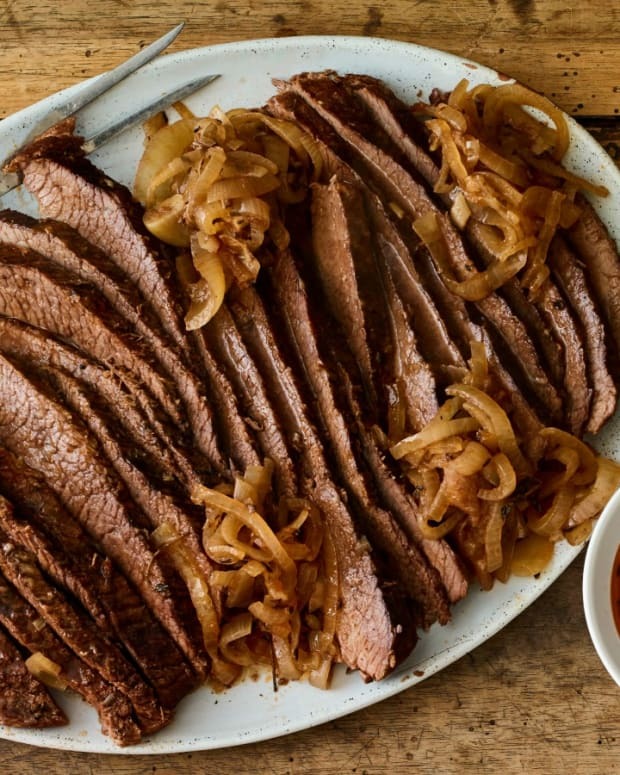 You’ll certainly want to use them if you plan to reheat the brisket before serving. 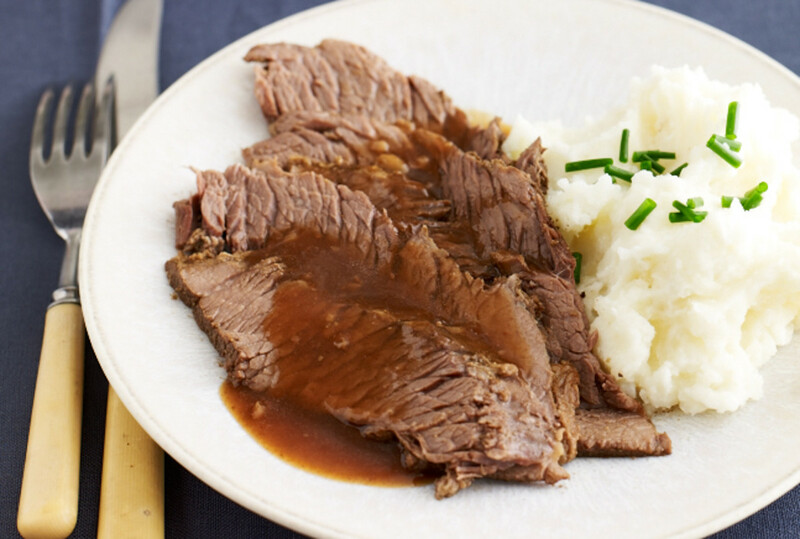 One more tip: practice saying “Beer Braised Brisket” before you announce it at your table, so you won’t twist your tongue too badly. Betcha can’t say it three times fast.